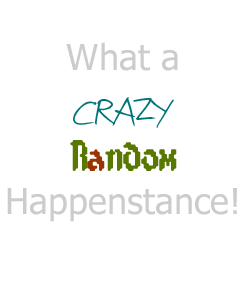 Coming Soon… : What a Crazy, Random Happenstance! I know I am far behind. I’m still trying to get used to this working mom thing. Granted, it’s only two days a week but it’s still a changed after 4 years of being a SAHM. Here’s a little of what’s coming. I hope that you will be patient with me as I work on getting caught up and that you will continue to stop by and see what is new.